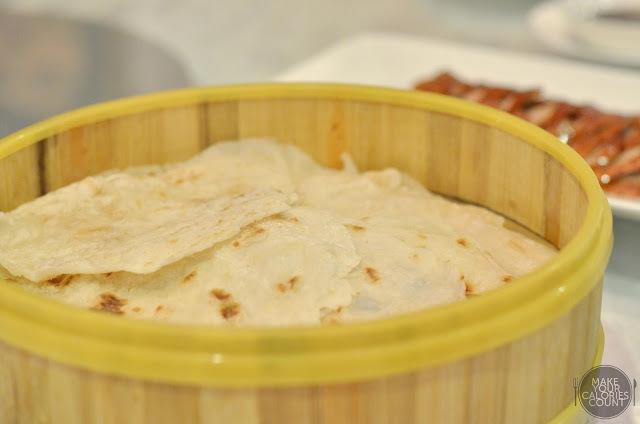 For those who work in the CBD area, you would agree that there is no lack of dining spots, be it local fare at Golden Shoe Food Centre and Lau Pa Sat, cafes around the Telok Ayer area and higher end restaurants for the important business luncheons. The newly opened Crystal Jade Prestige falls within the last category. 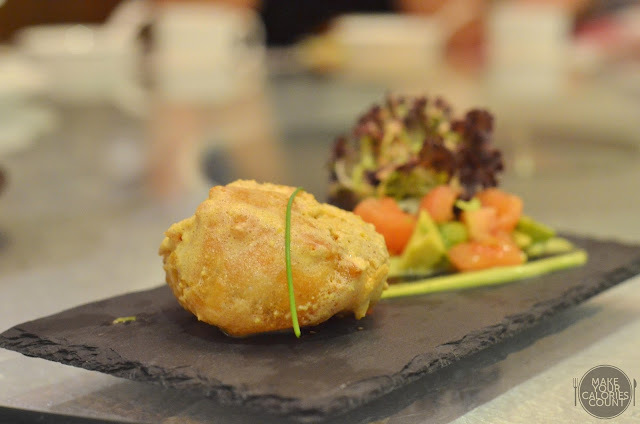 Located conveniently at Marina Bay Financial Centre (MBFC), it would be a perfect hotspot to bring clients or even business associates for lunch. With a range of food options on the menu, dim sum (offered during lunch time) and ala carte, expect to impress your dining companions. Definitely one of the highlights on the menu, this was a winner in all aspects, texture, flavour and fragrance. 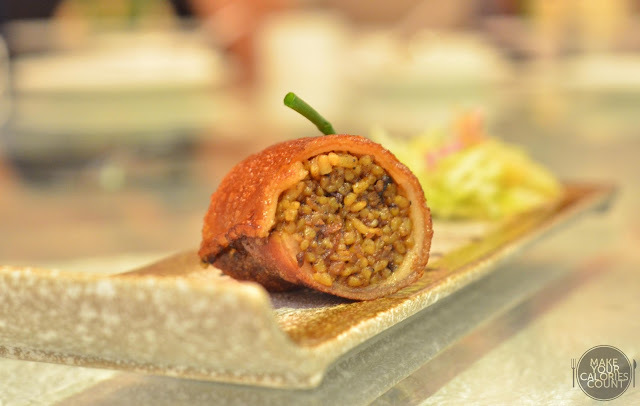 Wrapped by the crackling skin sliced off baby suckling pig, the roulade comprised plump grains of Japanese short-grain pearl rice infused with aromatic truffle and abalone sauce. Expect a lovely crackle at the back of your mouth with each bite only to be complemented by the granular texture of the fragrant rice. 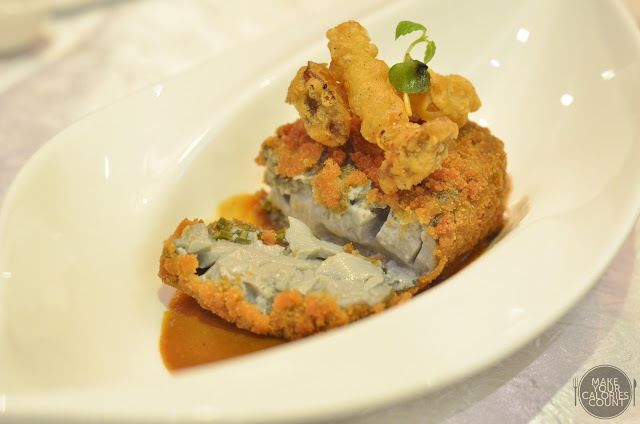 Available in individual portions or S$168++ for half suckling pig and S$328++ for whole. Impress your companion with this oversized scallop which comes served in individual portions. Encased in a light but crisp batter, the scallop on the inside remained tender. The chilled organic tomato with avocado sauce served on the side gave a very refreshing cleanse to one's palate with just the right level of acidity from the tomatoes, balanced by the richness of the avocado. As with any Chinese cuisine, soup is an absolute must. A light and clear broth, just good to warm the stomach! 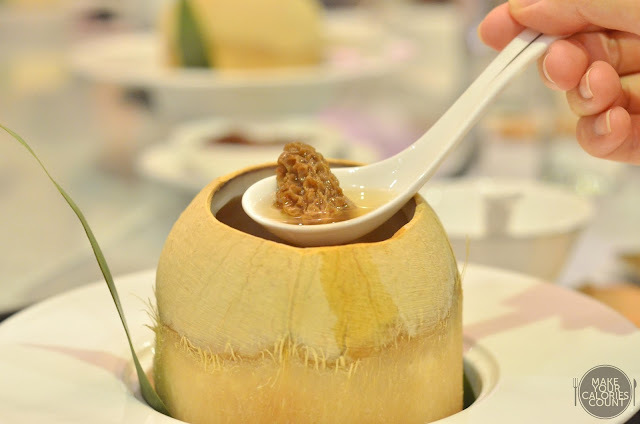 Served in a young coconut, expected a lovely aroma with each mouthful! 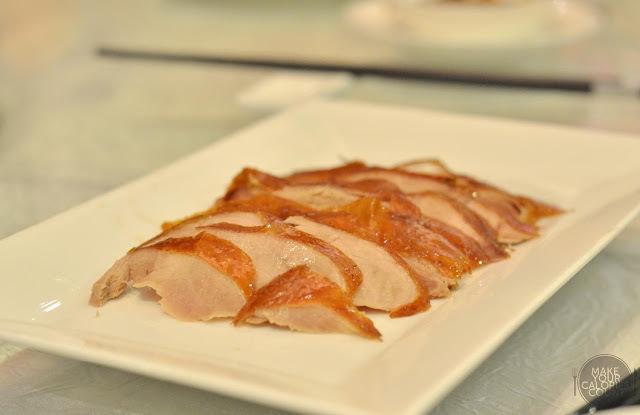 Everyone would be familiar with the usual Peking duck but tea-smoked roasted duck is something relatively new, at least to us! With a preparation and cooking process that takes almost 30 hours, the bird was definitely in good hands before being served to the table. Starting from marination (tea leaves and spices) which imparts all the flavours to the duck, it then goes through the roasting process before the final process of smoking for 45 minutes. The handmade crepe had greater elasticity compared to those off-the-shelf that you get at supermarkets or even some restaurants. 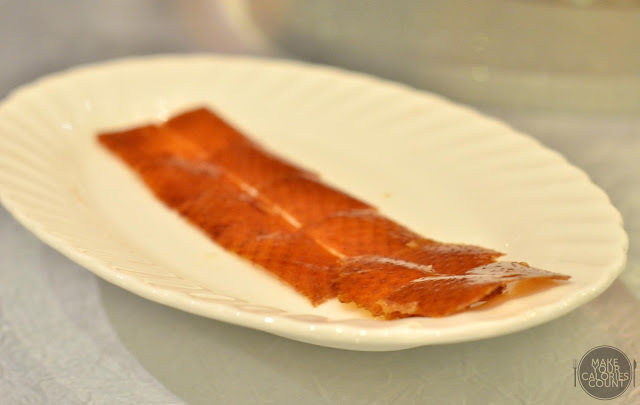 What really differentiated this from the usual Peking duck is the bout of intense flavours with each mouthful. You can really taste the difference with the distinct smokiness. Handled delicately by the chef, the duck was portioned to three plates - skin, thigh and breast meat. The crisp skin was meant to be dipped with refined white sugar and would dissolve instantaneously, almost, in your mouth. The high meat or the breast meat (depending on your preference for a fattier or leaner cut) would go well wrapped in the crepe. Not the most photogenic but it won me over in terms of flavours. Bold and distinct, the earthy flavour stood out delightfully though I would have preferred a slightly stronger truffle fragrance and taste. The dyed tofu on the inside was the result of introducing squid ink to the dish. What nailed it for me was the juxtaposition in terms of textures as the delicate tofu complemented the crisp texture on the surface. 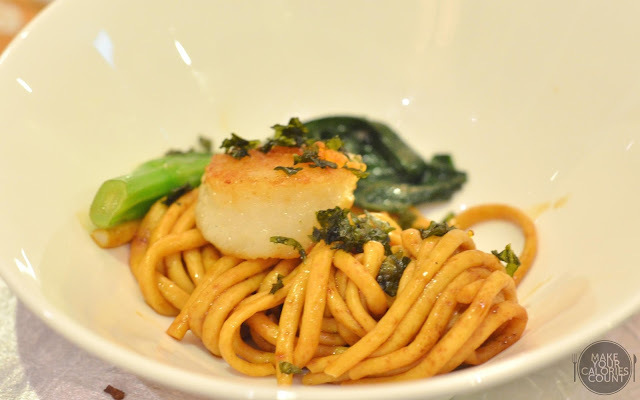 Not your usual noodles as these thick strands were made from springy fish paste tossed in an unami-rich prawn stock reduction. If you are a seafood lover, you would fall in love with this, nicely topped with a plump scallop! Sweet temptations to round up a sumptuous meal? 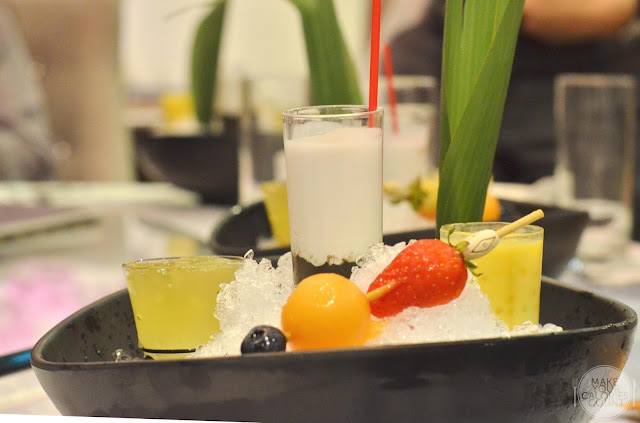 Perfect for those looking for variety as this trio dessert comprised tasting portions of aloe vera with lemongrass jelly, chilled mango puree with pomelo and sago and chilled black sesame with coconut milk. While I am a huge fan of durian and mango, having both together seemed like a dream come true but somewhat the combination did not spark for me. Perhaps the mains were themselves rather rich, this intense dessert came a little overwhelming in terms of flavours. 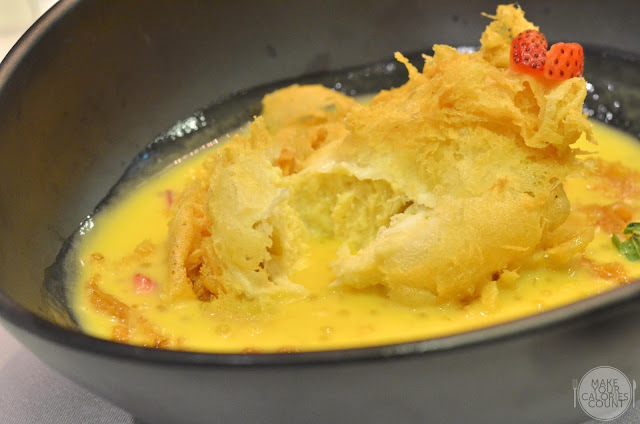 On the rich side, the handmade durian ice cream was a delight on its own, encased in a light batter. 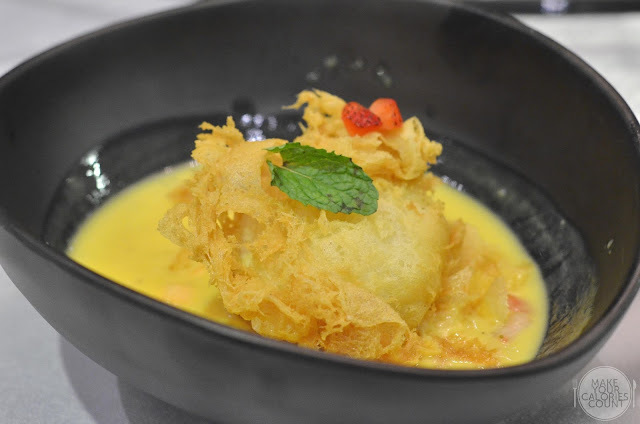 The mango puree was similarly good on its own, viscous and generous in terms of portion size. The interior decorations at Crystal Jade Prestige suggest a blend of oriental and western design elements, which makes the restaurant a hotspot for business meals. With four private dining rooms, it caters for intimate gatherings or if you prefer some privacy with family and friends. Would definitely return sometime soon with clients or business associates!